Recently a mum posted on the Tokyo Pregnancy Group (TPG) group on Facebook about where to get a 6 week old baby hip ultrasound in Tokyo. I had a similar experience when my baby was 4 months old, and took a video of the checkup and the results of the ultrasound to show my husband afterwards. The mums on the FB group expressed interested in seeing the video, so I decided to post about it here on Tokyo Urban Baby. I think the video will only be of interest to other parents in a similar situation though, so I have made the video private – if you are interested in seeing the video, please email me and I will register your email address so you will be able to view it (you will receive the link by email). Thanks! 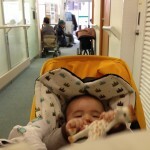 At my baby’s 4 mth health checkup, the doctor detected a stiffness in the right hip joint. 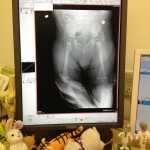 She recommended me to have his hip joints checked by a specialist. The orthopedist checked my baby’s hips, and he said they are both stiff! Hehe. 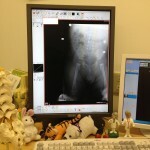 He said that both hips were in symmetry which is good, but he wanted to do an ultrasound just to make sure. (Note: a hip ultrasound rather than an X-ray is usually taken of young babies, as their bones don’t show up on an X-ray until about 6 mths age). The nurse took my baby into a separate room for the ultrasound, while I waited in the doctor’s room – it only took a few minutes. When they came back, the doctor brought up my baby’s ultrasound photo on his computer. He explained to me that the balls (little circles in the hip joint in the photo) were the same size, so there was no problem. He said that if the balls are different sizes, for example one is more than double the size of the other, then there is a possibility that there is a problem. For more information on baby hip dysplasia, I found this website helpful. Please note that my explanation above is just a rough translation of what the doctor said (we were talking in Japanese). If you are in a similar situation with your baby, it is highly recommended to consult with your doctor. Hi! Thank you so much for posting this. 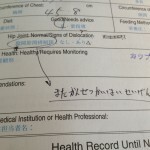 Our pedia also told us that our baby girl has tight hips during her 4th month check. Did the orthopedist tell you why your baby had stiff hips? HI Sarah, thanks for your message. He didn’t say why our baby had stiff hips, just that our baby is not very flexible in the hips. I think that might be the case, particularly compared to Japanese babies? 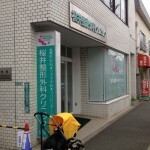 Japanese babies and children seem to be so flexible!